I started on my new craft project this afternoon. I'm making linen runners for tables and dressers throughout the house. 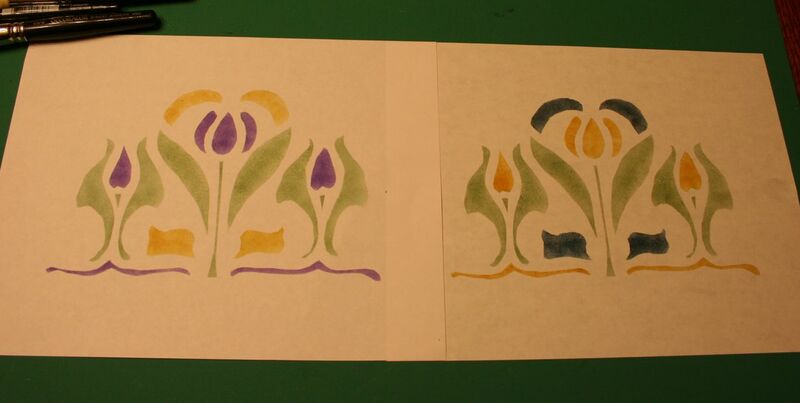 As usual, I try out color combinations on paper before I apply them to fabric. 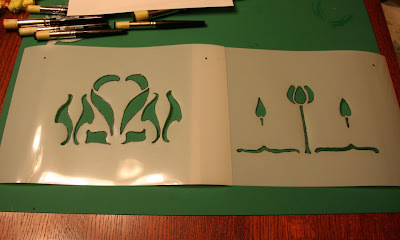 I cut out today's stencil with a craft knife. While the edge on the mylar is much nicer to clean after stenciling, cutting the stencil was not fun. I may have bought mylar a bit too thick for hand-cutting because it was a significant effort to cut this stencil out. Also, it was difficult to cut a smooth curve so some of my edges are a bit rough. 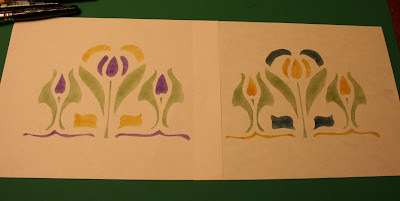 Since stenciling, I've tried to smooth out some of the curves so hopefully the next round will look better. 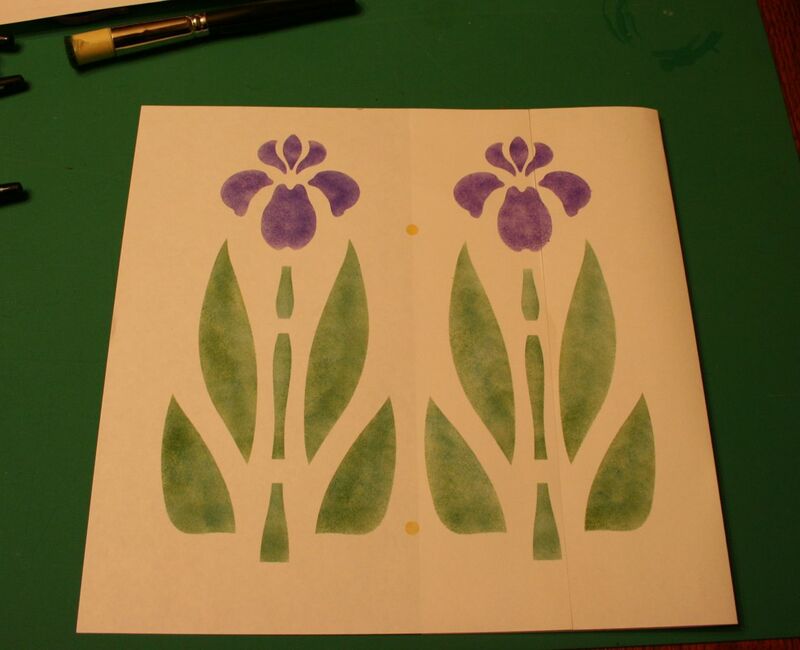 I tried this stencil in a couple of color combos. The purple is fun and I may use it someday, but for this project I'm going to go with the navy-green-yellow because it matches the dining room rug better. I had been planning on cutting a few more stencils to try out for this project, but now I think I'll try harder to use stencils I already have. Here is what I'm going to use for the master bedroom. This particular stencil was purchased from "Bungalow Borders" by Helen Foster a couple years ago, before she sold out to Fair Oaks. I poked around their website, but this design seems to have been discontinued. I'm going to make a curtain for my closet door with this panel. And I'm going to use this arrangement for the dresser scarf. These colors match the iris quilt and they should go well together. Now that I've got these two rooms figured out, I can get started cutting and hemming up linen strips. That project looks fun...I don't think I have ever stenciled. 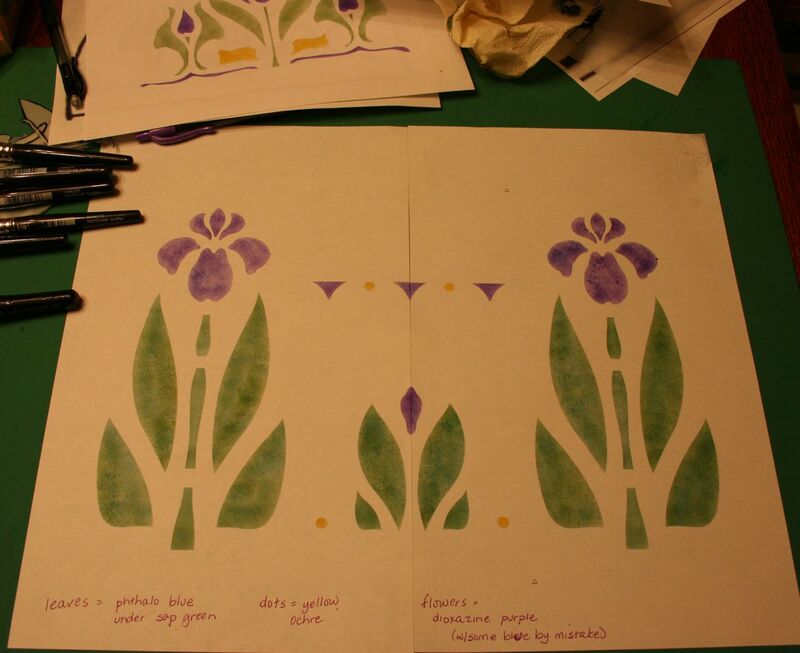 Have you tried using one of the hot knife stencil cutters? I keep debating buying one for stenciling . . . Glad you kept the crafting on the house blog! Yes, I bought one last fall. And while it does work at melting the mylar, it leaves a thick and rough line along the edge of the design which is difficult to wipe clean. That's why I tried cutting this one. I'm not sure what to try next time. I think I need a new craft knife blade. good to know, guess I'll just keep sending my money to the stencil library! I don't mean to put anybody off cutting stencils. It wouldn't have been so difficult if I had used thinner mylar. I just bought very thick mylar--too thick. Since I don't need to stencil an entire room with this stencil, a thin mylar would have worked fine.